iCue is a full featured teleprompter solution for iPad. 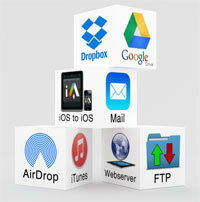 iTunes, Dropbox, Google Drive, AirDrop, Mail, Web Server or device to device. iCue Remote is free from the App Store and provides to most comprehensive control of iCue.